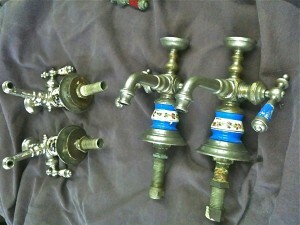 Don now has a blog, to talk about anything and everything victorian plumbing. Lets give this a try, and see if it is worth maintaining. I will use this space to discuss topics of interest to visitors of my website, www.vintageplumbing.com. 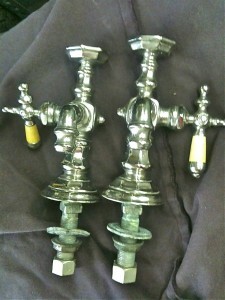 If you are an enthusiast of antique bathroom fixtures, I would like to hear from you. To stimulate some conversation, here are two images of an extraordinarily rare toilet bowl made for the J.L.Mott Iron Works Co. by the John Dimmock & Co. Hanley Staffordshire Potteries, England in the late 1880s. This bowl was called the Grecian Vase and was connected to a wooden high tank, typically one with brass strap and bullets decoration, like the one shown below. This is a reverse washout or reverse "elephant trunk" style bowl and used a wooden seat that was fastened to the wall with small brackets. If anyone has a bowl like this still in use, let's hear about it. 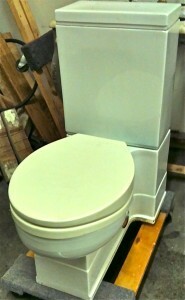 Send me some pics of your victorian bathroom restoration projects, and I will post here for others to enjoy. The first comes from Robert in CAN, and he says it is a living nightmare, but one he will not stop until it is finished. 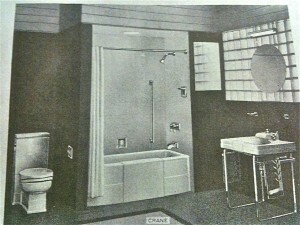 There is a 1930s bathtub and Crane elephant trunk toilet coming out, and a fancy embossed John Douglas Co. toilet and Wolff Mfg Co Neptuna tub with fancy wall-mounted Wolff Co.shower going in. Here is another bathroom view that comes from B.S. in Portland, OR. This is a ca.1905 bathroom makeover with stunning details expecially in the floor and wall tiles, the lighting sconces, and the wall accessories. 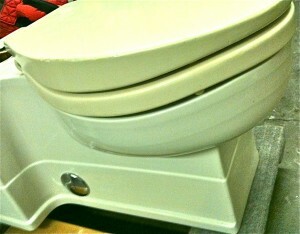 The lavatory standing on two beautiful nickel plated legs ain't too shabby either. This restoration obviously had a lot of care and attention to detail applied. The lavatory came from Historic Houseparts in Rochester NY, the accessories are all original Art Brass Mfg Co of NY, and the sconces are fugitaboutit, impossible to find. This fraternity of people who are interested in Victorian era bathroom relics is not huge, like some of the other house part collector niches such as for lighting, glass, or furniture. But there are still many aficionados out there. One of them is David F. from the Lancaster PA area. Here is a photo of him surrounded by some of his treasures. 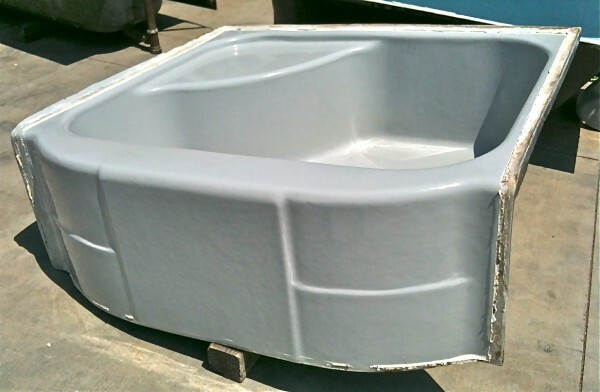 Shown are a beautiful L. Wolff Mfg Co Neptuna roman tub, John Douglas and Jas. 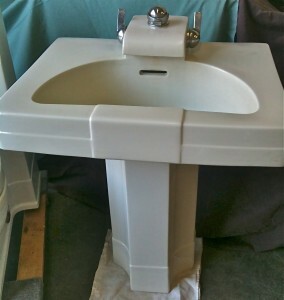 Robertson Mfg Co embossed toilet bowls, a Thomas Maddock Sons & Co pedestal sink, and a urinal with fluted front. 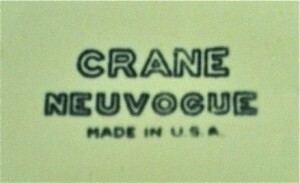 If any other collectors find this Blog, please drop a note, and an image or two of your treasures. I am interested in rapping with anyone who has an interest in plumbing trade catalogs from the Victorian era. I have been collecting them since about 1980, and have amassed about 150 or so, including some of the very best ones. 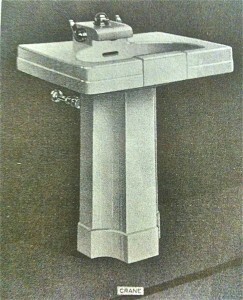 These catalogs are the best way I know to become educated in the world of Victorian bathroom fixtures. I am always on the hunt for some of the good early ones, by the better known companies, especially the ones with the full page color lithograph illustrations. I have several duplicates of some of my best books, and will always entertain trade offers. If anyone out there has one or more of these great early catalogs, please drop a comment, and lets talk about it. Shown are three real special original catalogs. The first is Mott's Plumbing Catalog A 1908, the second is Standard Mfg Co. "Standard Baths, 1891" and the third is an original 1888 J.L.Mott Iron Works Catalog G, the book that is so widely available as a reproduction by Dover Books.